IGL Web Review 2019: Is IGL Web a Good Hosting? IGL Web is an all-inclusive web presence provider that offers all the services required to build, manage, and boost your website. 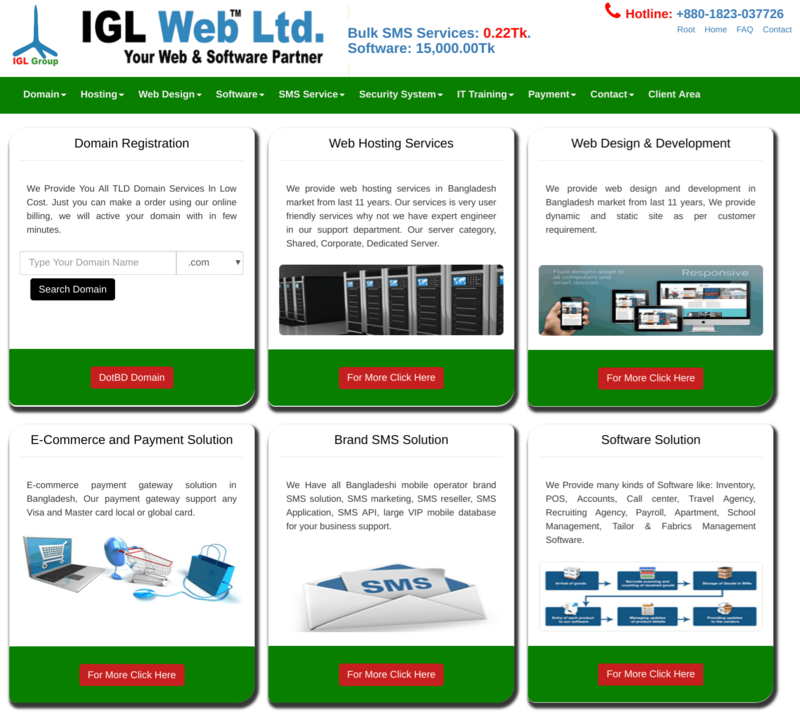 Bangladesh-based IGL Web specializes in web design, web hosting, web applications, mobile apps, and desktop applications. This company started out in 2007 as a data entry organization but today provides several web-related services to help you grow your web presence. IGL Web’s website is available in English. Your website data is secured by regular backups, and the higher hosting plans come with unlimited bandwidth, disk space, and FTP accounts. IGL Web includes a website builder and software auto-installer with its hosting packages, so that it’s easy to set up a website without any coding experience. This provider also offers training in website management. U.S. and Bangladesh data centers, plus servers in the U.S., allow IGL Web to provide fast access to your website from anywhere in the world. IGL Web offers a wide range of web hosting packages on eight different price plans. All prices are displayed on the website in Bangladeshi taka, so you’ll need to take account of the currency exchange rate. A quick calculation tells me that the USD-equivalent prices are reasonably affordable. You can pay for plans by various methods including PayPal, credit cards, bKash, UCash, or wire transfer. Not sure about signing up? You needn’t worry too much because the 30-day money-back guarantee should allow you to get out within the first month if you change your mind. It’s a good thing that the one-to-one support is so good because there is no real knowledge base to speak of for self-support purposes. IGL Web’s greatest strength may lie in the additional services it provides besides web hosting, to help you build your web presence from scratch. The only problem is that the company’s website provides limited information about these ancillary services. To create an entire web presence, IGL Web could be ideal. Wondering how IGL Web stacks up against other Web Hosting companies? Enter any other Web Hosting company and we will give you a side-by-side comparison.